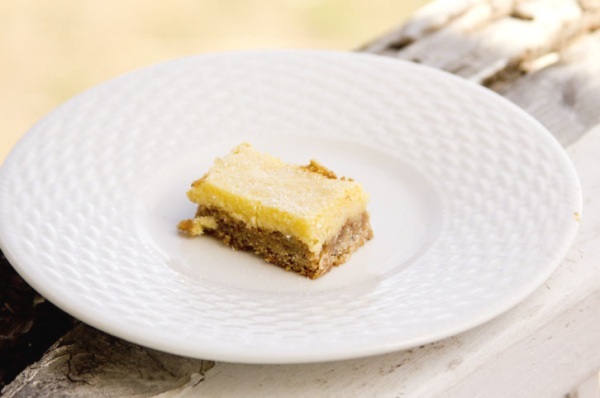 When I first saw these bars in Martha Stewart Living, I had died and gone to coconut-lime heaven. I am such a fan of Martha’s, and I especially love their emphasis on seasonal food choices. On top of that, I am seriously crushing on the way they are starting to embrace a little bit of the gluten-free vibe in their recipes. This makes it super wonderful to put together the small changes I was able to make to bring this recipe the rest of the way to work with sugar-free, lower-carbohydrate needs. The clincher? Since each serving contains only 1.5 carbs each, you can enjoy this guilt-free bar cookie with coffee, with friend, but, as always, without the guilt. Line an 8 x 8 pan with parchment paper. Lightly coat with non-stick spray. In a medium mixing bowl combine flours, brown sugar substitute, and mix to incorporate ingredients. Add butter and use forks or a pastry blender until butter is the size of peas. Add coconut and white chocolate. Mix. Press into the pan evenly and bake for 15 minutes. Change oven temperature to 300 degrees Fahrenheit. In a medium mixing bowl, combine eggs, sweetener, coconut flour, and lime juice until blended. Pour into the pan to cover the crust. Bake until set, 15 minutes. Let cool completely in the refrigerator overnight. Lift out parchment carefully and cut 1″ squares. Keep cool (and the bars, too). Before serving, sprinkle with confectionery sweetener. Makes 64-1″ x1″ bars, or 32-1″ x 2″ bars. These looks yummy! Do you have a no-or low-sugar white chocolate chip to recommend? When it comes to white chocolate chips, you’re pretty much stuck with what’s available. That said, you might be able to use a mild sugar-free chocolate chip instead! Hello, looks really good – but i am confused about the nutrition you give – would the 1×1 not just be half the 1×2, or the 1×2 double the 1×2? Seems to be some anomalies in there? Hi, John! the 1 x 2 is just double the 1 x 1 piece, so it’d be the same as if you had two of the 1 x 1 servings. Can you double check the carb counts on this? For example, how come the larger bars have 6 g fiber and the smaller ones, none? Things don’t quite add up…. The corrections have been made. Thanks so much! Good Morning, Can I say these look wonderful and I can’t wait to try them. Can you look over your Nutrition breakdown please. On the 1″ bars you don’t show any fiber. I always thought you could subtract fiber and sugar alcohols from the carbs to get Net Carbs. Is this just a typo or have I been fooling myself all these years. It doesn’t really matter, it certainly won’t keep me from trying this recipe. 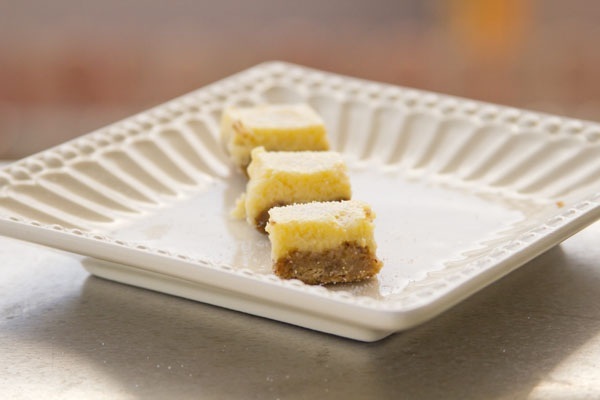 I love lemon bars and can only say these lime bars look scrumptious. You are wonderful about bringing yummy recipes with their breakdowns for all of us who need to be watching for those things. Thanks for all your hard work. These look amazing! They are still 1.5 – 2.0 NC per piece even with white chocolate chips? Really is it true? Hi! I ran the numbers in MyFitnessPal with the brands and the products, and those were the numbers it gave me. You could also chop up a dark chocolate bar. I say if you go with dark chocolate, consider switching the lime to lemon juice. Oh Jamie these sound perfect! Quick questions – what brown sugar sub and confectioners sub to you recommend? Also, do you have a good place to purchase Hazelnut Flour or do you make your own? Can I use almond flour instead of the hazelnut. Here in Canada we do not have the range of products available. That you have in the US. You bet! I say use the almond flour. Do you think it would work if I substituted almond flour for the hazelnut flour? How do you choose which to use in a recipe? Hi! The original Martha recipe uses hazelnut flour, so I wanted to give that a shot. Almond flour will work wonderfully, too! Almond is more robust and I’d say that the hazelnut is slightly more earthy. I can’t wait for this weekend to make these bars. I don’t have hazelnuts (flour) so I will be substituting walnuts. I’m sure they’ll be great either way! Totally. Walnut flour will work fine, too! I hope you enjoy it! It’s a fun, easy recipe, and the crust is so good. 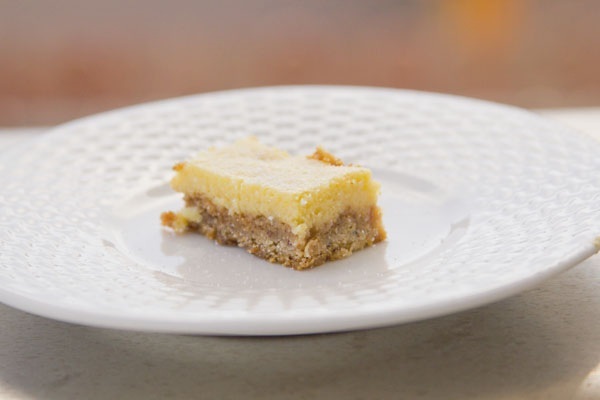 I live in Indonesia and we can’t find sugar free white chocolate here, but I really want to try this recipe and keep a similar flavour – so I don’t want to use dark chocolate as a replacement. What would you suggest? I was thinking of just adding 1/2 cup more hazelnut flour, 1/4 cup dessicated coconut, a bit of stevia (for sweetness) and some more butter (for binding together.) Do you think that would work? Or, should I just do a completely different crust? Your idea sounds yummy and great! Try it and let me know how it turned out! Just ate another piece of this delightful treat! I cut it up into pieces and shared it at school with my coworkers. It got RAVE reviews! I altered the crust as I mentioned above, but I also added 2 teaspoons of coconut cream powder to the crust. Then I made the lime topping as directed, using 1/2 Splenda and 1/2 erithritol. My topping became quite cracked – is that normal? I was thinking it might be because my coconut powder is extra absorbent, and I might need to only use 2Tb. Thanks for the wonderful recipe! I will definitely be making this again and again! I made these last weekend and they were delicious! I am fortunate that I am currently living in Germany (I’m American) and Haselnut flour and dried unsweetened coconut are normal things to find in the baking aisle at the grocery store! I baked it in a 9×9 pan, and had to shorten the baking times a little. The only other note I would make is to pour the filling over the crust very carefully. I just sort of dumped it on without thinking and bits of the crust floated up to the surface, which wasn’t very attractive.